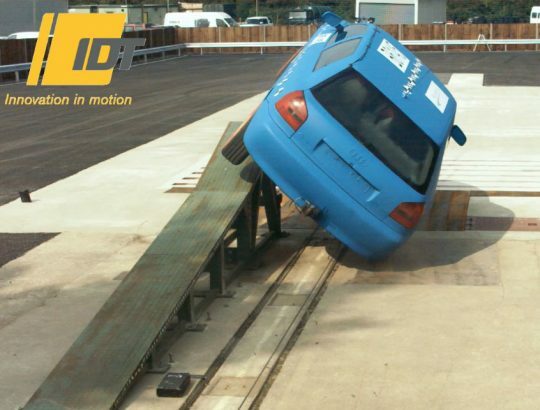 Millbrook Proving Ground (UK) have recently launched a new test facility, for roll over tests. IDT were pleased to be involved in this, by supplying extra cameras for the publicity filming of the initial vehicle test. A CC-4010 camera was used to film at 1000 fps using a resolution of 2560 x 1600 pixel, and an Os7 set to 1000 fps at 1920 x 1080. These was added to three of Millbrooks existing NX-Air5 cameras, each recording full HD images of the test. All were automatically triggered using a contact strip placed at the base of the ramp. The launch was covered by Automotive Testing Technology International. Their report is available upon request. See the movie in our gallery now.